The most requested #restaurants in each state. Not every restaurant is available everywhere, so QSROnline.com sought to find out which restaurants were the most requested by residents of each state. Some pretty interesting results. I would have thought IN N OUT in Illinois. Here ya go! Now can we retire the “McDonald’s is Dying” stories forever? I’m Lovin’ It! I’ve spent the last year calling BS on the argument that McDonalds is dying off. Every few years this story comes along when sales or the stock price dips. Every time it’s been market hysteria, click baiting and wishful thinking. Today we see with a few tweaks sales are up and share price is soaring to all time highs. Keep in mind McDonald’s has the resources and experience to create the best systems and recruit the top minds in the food service business. They are not going away anytime ever. While I am at it, those who attack the nutritional content of McDonald’s food should compare their published nutritional data with an analysis of the hipster fast feeders such as Shake Shack, In N Out, Chipotle etc. I believe a Big Mac has a lot less fat and calories than the most popular items on many menus that get a pass on health criticism. On the run, I’m good with an Egg McMuffin (no cheese) or a Quarter Pounder. I don’t feel like taking a nap afterward like I would with Five Guys. Check out the specifics on McDonald’s latest results here. And even the enemies of fast food admit it here. Eat a balanced diet and McDonald’s won’t hurt you now and then. Poutine will kill ya a lot faster! 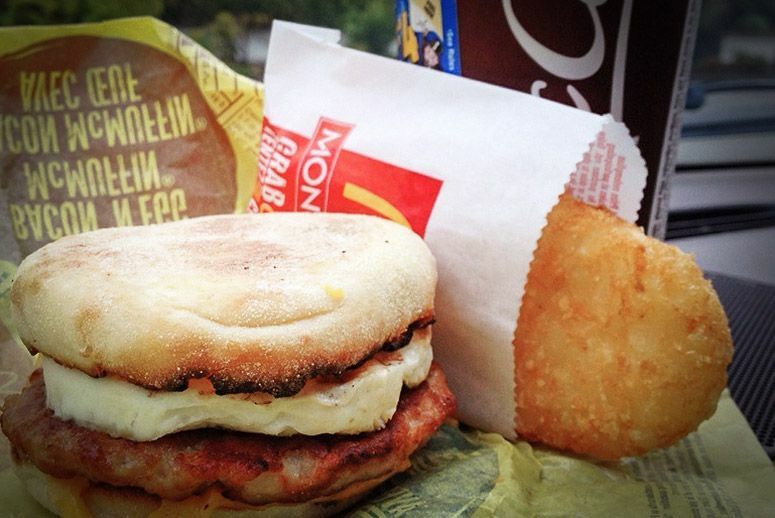 All day breakfast has been one of the ingredients in McDonald’s tasty sales uptick. I believe SmartWiFi is a great idea for bars, restaurants and other businesses. Run your loyalty program and customer discount offers on the WiFi that customers use in the establishment! I haven’t figured out the best service yet but here’s a few that are out there. Let me know your thoughts, any operators that are using these or considering. ~~ A big player is entering the Chicago market to rival Buffalo Wild Wings. UPDATED :: In over 10 years as a key player in more than 40 successful openings and long term success of bars, restaurants and nightclubs, I have seen a lot of competitors fail. As much as I’d like to claim we “killed the competition,” often they actually kill themselves, sometimes before they even open. Following are the Top 10 key reasons bars, restaurants and nightclubs fail. We are currently offering a free consultation to help in any areas needed! (1) The restaurateur/owner does not understand what business they are actually in. Their fantasy does not match the reality of running a successful operation. No one thinks they can hang a sign and have a dental practice with no training because they brush their teeth every day, but many people think they can launch and run a restaurant or bar because they like to go out for dinner and drinks, or maybe they worked in a bar for a while. There’s much more needed to succeed. (2) Typically when developing the restaurant too much is spent on construction, equipment and decor and not enough on staffing, training and marketing. Many new owners love to spend on “things” and are reluctant to spend on people which are the #1 key to a good guest experience. (3) Careful research is not done prior to opening on politics in the community, and vital relationships are not forged with people in local power positions (over your liquor license and inspections for example!) Particularly, beverage driven venues can set themselves up for constant trouble from authorities once they are open. “Connected” experts are needed on the team, as no single person or owner knows enough about the various players and issues. This is survival stuff that all too few pay enough attention to! (4) Concept Development is not led by someone with a successful track record of launching multiple bars and restaurants, so the right concept is not chosen to fit the demands of the market and the team fails to maximize the best opportunities to make money at the particular site and in the various desired target markets. (5) Four walls marketing (inside the venue) and generating repeat business are given minimal attention when they should be the most important two parts of the marketing mix after opening. (6) Lights, music, atmosphere (temperature/comfort) are not consistent and appealing. These are simple basics yet hard to maintain. Circling back to point (1), many who open restaurants don’t realize it’s the details that make or break you. The latest House Bill redefining full time work at 40 hours per week is good for the restaurant/bar industry including its workers, as it will decrease the amount of shift cuts for part time workers. 40 hours has traditionally been the definition of a full time job and 30 hours should not be seriously considered full time work.